Providing clinicians with everything needed to practice dynamometry, Hand-Held Dynamometry: Guidelines for Daily Clinical Practice is the fundamental resource for any clinician applying evidence-based practices. 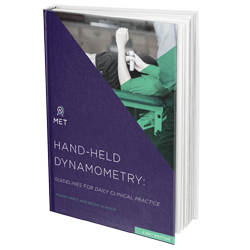 Broken into five detailed sections, this guide opens with a foundation of the science and research supporting the use of hand-held dynamometry as best practice in the modern clinical setting. That layout undergirds the "movement, muscle, exercise" delineation that helps clinicians apply research in a systematic way. Experienced clinicians and new practitioners alike will benefit from this streamlined, reliable, and valid system for objective strength measurement. The clinical therapeutic fields have long battled against one large challenge– objective measurement. In the early stages of a therapeutic plan, the majority of the assessment is done with an inherent practitioner bias. It's no fault of the therapists. Rather, practitioners have for decades lacked appropriate instrumentation and training to apply the benefits of modern technology to their science. Those days are gone. The simplification, miniaturization, and affordability of dynamometers have brought the power of empirical measurement to the hands of well-trained clinicians the world over. While hand-held dynamometers are not a new invention, their application in clinical settings has been inconsistent. While a plethora of research exists demonstrating dynamometry's efficacy, the testing positions are inconsistent, the props are cumbersome, and inefficiencies make it nearly impossible to transfer the research into daily clinical practice. Hand-held Dynamometry: Guidelines for Daily Clinical Practice bridges the gap between research and clinical practice by serving as an approachable and comprehensive resource for clinicians to reference.